SHIBERGHAN - Vice President Gen. Abdul Rashid Dostum has vowed to established complete peace and security in three Uzbek dominated provinces in northern Afghanistan. 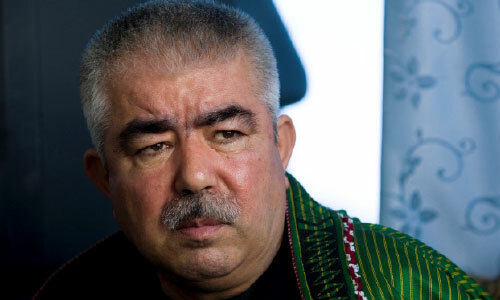 After surviving the Taliban attack on Saturday evening, Dostum said current security situation in Faryab, Jawzjan and Sar-i-Pul provinces was not acceptable to him. He was addressing a huge gathering of his supporters in Shuhada Park in Shiberghan, the capital of northern Jawzjan province. The Taliban attacked the convoy of Dostum in northern Balkh province late Saturday evening, killing one of his bodyguards and injuring two others, an official said. Syed Shamsuddin Sadaat, a representative of the Junbish party in Balkh, told Pajhwok Afghan News that Dostum arrived in Mazar-i-Sharif this afternoon from neighboring Uzbekistan. He said Taliban militants attacked Dostum's convoy en route to Jawzjan province in Timorak locality of Chaharbolak district of Balkh on Saturday evening. The first vice president vowed to avenge the killing of his personnel from the Taliban and added the uniform which should be wore while fighting the enemy was with him. He pledged not to go away until insecurity and instability is completely eradicated from the Uzbek dominated provinces. He assured the women not to worry regarding peace talks saying nothing dangerous would happen.